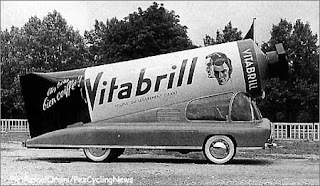 I loved all the images from this 6 year old article from some cycling online magazine about the corporate caravans during the Tour de France. Take a look here before they realize they still have it posted after all this time, and take it down. 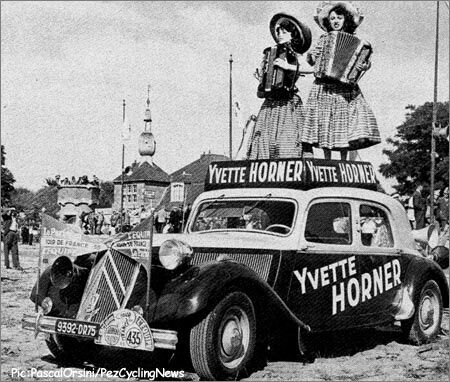 The description on Yvette's caravan says, "Yvette Horner, a French accordionist has participated to 11 Tours de France....In towns she was playing on the top of the roof of the Citroen traction. Between towns, a dummy figure took her place. 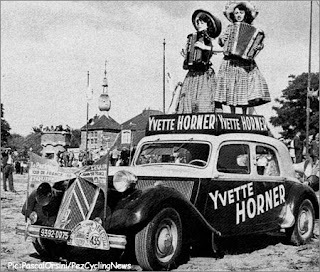 Some years later the system has been improved, Yvette was behind a glass to protect her from the insects."